Julius Caesar, Jewels, A 24-Decade History of Popular Music, The Lucas Bros. The year is 2118. Climate change has ravaged the earth, leading to a complete technological breakdown. The social order has collapsed and, fed up with the failure of male leadership, women have assumed power. Cut to Rome. Our heroine, Julius Caesar, is returning from victorious battle. 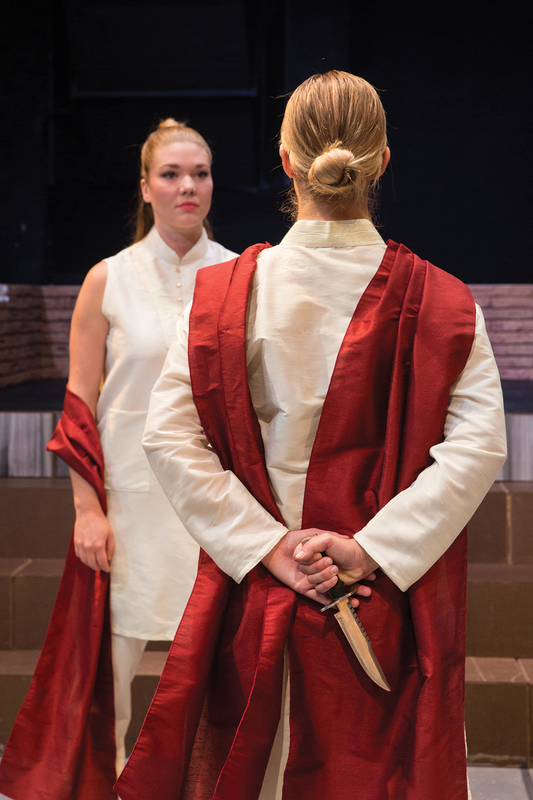 The University of Utah Department of Theatre's production of Julius Caesar, guest directed by David Carey, asks audiences to consider what happens when women hold power, and how citizens and leaders should react when faced with political uncertainty. Although Shakespeare wrote Julius Caesar 400 years ago—and the play is based on events from than 2,000 years ago—Carey believes the play remains relevant today. "The play deals with the consequences of authoritarianism and idealism in the political sphere. At a time when populism, authoritarianism and the idealisms of left and right are threatening the basic tenets of democracy, it feels right to be mounting a production of Julius Caesar." Can we defend democracy by undemocratic means? The play suggests an answer. To bring the script to life, the crew designed a futuristic set and costumes, and for months, the cast of 13 women and five men has practiced carefully choreographed fight scenes. Carey's gender-flipped casting led to the development of its 22nd-century setting, in which Caesar proclaims herself "Mother of the Motherland." First performed in 1967, Jewels was developed by George Balanchine, a man often credited with being "the father of American ballet." Inspired by his relationship with jeweler Arpels, Jewels has no plot, and instead centers around the dancers' skills intermingling with the musicality of the piece. 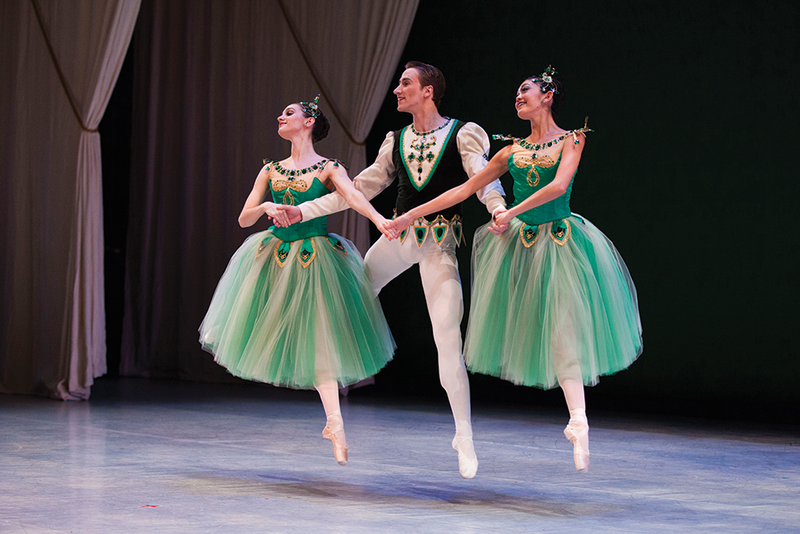 Ballet West kicks off its 55th season with a dazzling celebration of dance in Jewels, a three-act abstract ballet. The rest of the company's season will tackle everything from classics like The Nutcracker and Swan Lake to more recent and dramatic works like Onegin. Adam Sklute, Ballet West artistic director, says though Jewels is plotless, it presents a magical world that anyone can enjoy by focusing on the skill of its dancers. "You don't have to know anything about ballet to enjoy the show. If you just want to see a great show, this is it," Sklute says. "It's athletic and dynamic. And it's amazing how hard the dancers work and how they don't show it." Each of the ballet's three acts tells a self-contained narrative that explores the essences of precious stone. "Emeralds," the first act, conveys French elegance, with the dancers performing an incredibly demanding routine making it seem effortless. "Rubies," Sklute says, is a marathon, with dancers going intensely and nonstop throughout the act. The final act, "Diamonds," evokes the bygone grandeur of imperial Russia. Music can serve as a signpost for times both good and bad, underscoring our collective identityand providing comfort during tragedy and turmoil. That's the premise for Taylor Mac's grand and garish spectacular A 24-Decade History of Popular Music (Abridged). Don't be mistaken; this isn't some stiff, stodgy history lesson. 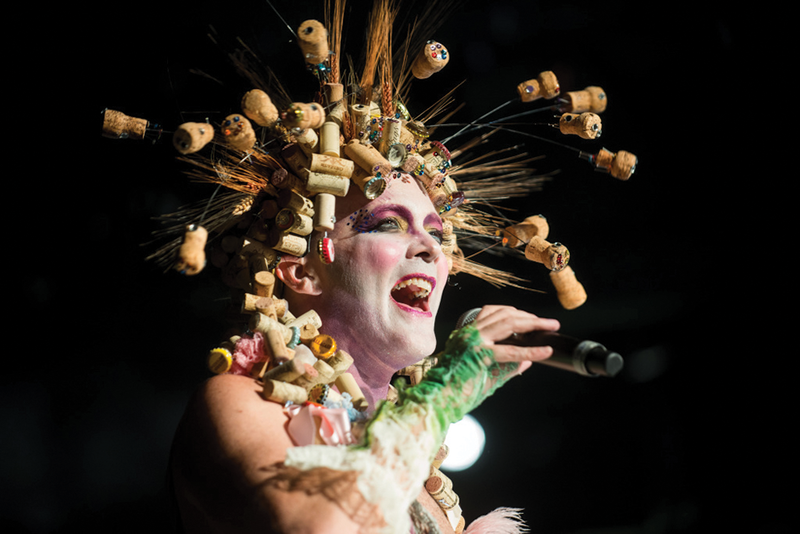 It's a daringly experimental stage show that spans an entire history of American popular music, from 1776 through the present. Originally 24 hours in duration—with each hour dedicated to a specific decade in that era—the show visits Utah in its more manageable 2-1/2 hour "abridged" version. Nevertheless, it doesn't sacrifice the insight, entertainment and intelligence offered in the original. Mac—an actor, playwright, singer, songwriter, performance artist and graduate of the American Academy of Dramatic Art—has been called "a cross between Ziggy Stardust and Tiny Tim." He draws on the influences of classical Greek theater, drag queens and traditional musicals in creating multi-dimensional, one-man shows that have reaped numerous awards and kudos, including a finalist nod for the Pulitzer Prize for Drama. There are many different roads that people can take into an artistic career. 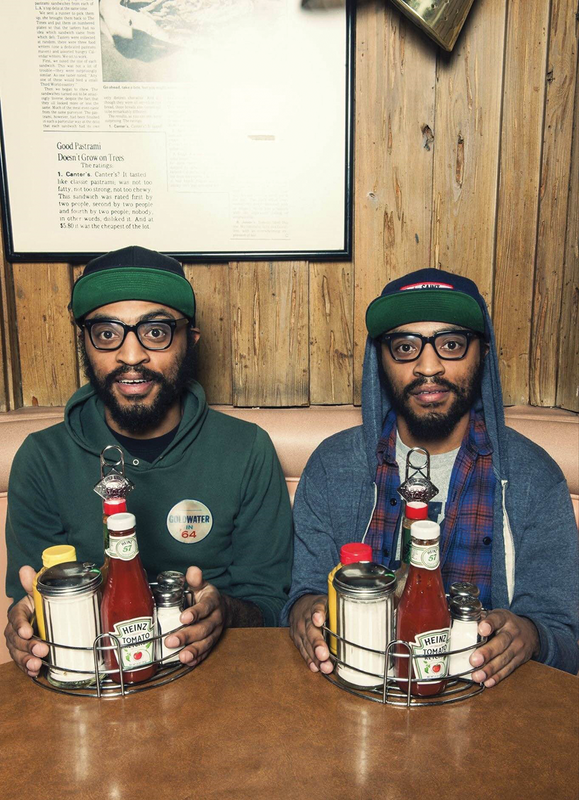 For Keith and Kenny Lucas—the twin stand-up comedians who perform together as the Lucas Bros.—that road involved both of them dropping out of law school to chase a different dream. "I was at NYU law, and Keith was at Duke," Kenny says. "I think we were having a sort of similar response to the prospect of being lawyers for an indefinite amount of years. ... I was always fascinated by [comedy], but didn't think I'd ever have the confidence to stand on a stage and make a fool out of myself." But the brothers did jump together circa 2009, and began a career that has taken them to late-night talk show appearances, a season of the animated series Lucas Bros. Moving Company on Fox, roles in 22 Jump Street and a 2017 Netflix special, On Drugs. Through that process, they've perfected a performing style that has them applying their unique, often deadpan voices to everything from pop culture to hot-button social issues, capitalizing on their sibling chemistry. "We were influenced by a lot of the same individual performers: [Chris] Rock, [Dave] Chapelle, [Jerry] Seinfeld," Keith says. "But in terms of how we're going to do it on stage, we looked a lot to television pairs: Jerry & George, Lucy & Ethel ..." "Beavis & Butthead," Kenny adds. "We also explored classic vaudeville stuff like Abbot & Costello."